I have another low carb dessert for you today and I am so excited! Last week I brought you Low Carb No Churn Strawberry Cheesecake Ice Cream which is seriously amazing. I love having a catalog of low carb desserts that are easy. It is so easy to just go grab a chocolate milk shake from the drive through, or a box of cookies from the grocery store. 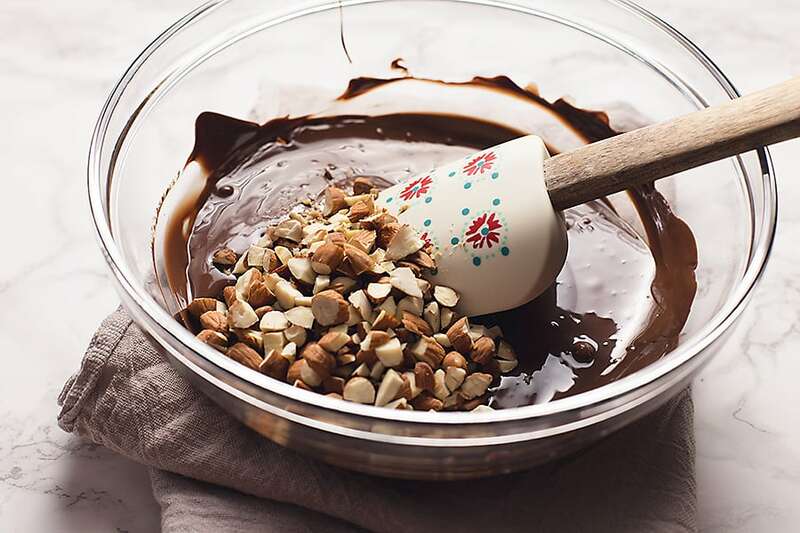 If you keep some of these low carb desserts on hand, like this sugar free chocolate bark, you will be killing your low carb game! I have to admit that I hate baking and making desserts. I think it is the measuring of the powdery ingredients that turns me off. They make such a mess! 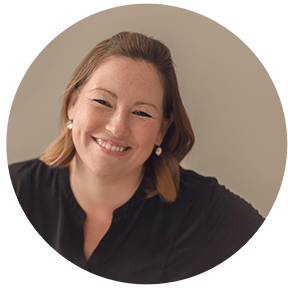 That’s why I keep the recipes on this blog so simple! This sugar free chocolate bark is really one of the easiest desserts I have ever made. I guess the hardest part would be melting the chocolate. I melt mine in the microwave, as opposed to using a double boiler. I think the microwave method to melting chocolate is so easy! All you do is pour your chocolate into a microwave safe bowl (I used Lily’s Chocolate because it is sugar free), put it in the microwave for 30 seconds, stir, do another 30 seconds, stir again. You might have to do one last round of 15 seconds. You want to make sure you have a little bit of unmelted chocolate chips leftover when you pull it out of the microwave. Then stir one last time and it should all be melted. 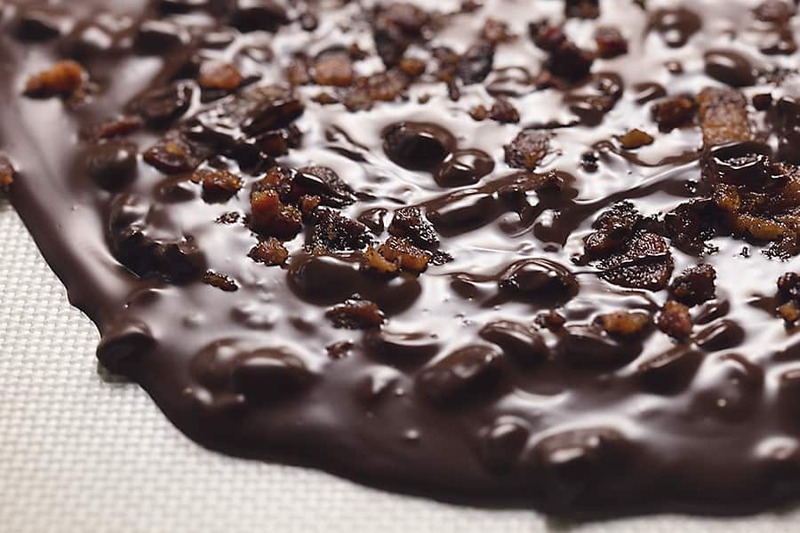 Lets get to the secret ingredient in this sugar free chocolate bark…bacon. It really makes this low carb dessert taste out of this world amazing. If you are new to this blog, you may not know that I have an obsession with bacon. It’s true…bacon is my BFF. I have a whole section dedicated to the amazing stuff. I need a 12 step program. In a microwave safe bowl, microwave the chocolate chips on high for 30 seconds, stir. Microwave for 30 more seconds and stir. Microwave for 15 seconds then stir one last time. You want to make sure you have a little bit of unmelted chocolate chips leftover when you pull it out of the microwave. Then stir one last time and it should be all melted. on a parchment lined baking sheet, pour the chocolate mixture in a thin layer, about 1/2 inch. Sprinkle the crumbled bacon on top of the chocolate and press in with a spatula. Refrigerate for 20 minutes or until the chocolate has completely hardened. Peel the parchment from the chocolate and break into 8 pieces. Store in the refrigerator. What is a vegetarian option for bacon? Just omit the bacon? What else can we add in? Can you post the nutritional information?